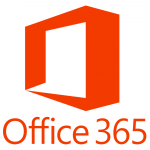 Cobb County School District is providing Microsoft Office 365 FREE to all Cobb students! The service includes access to the full suite of productivity applications, including Word, PowerPoint, Excel, OneNote, and others. Students also get a terabyte of cloud file storage in OneDrive! Students can look up their username in StudentVUE and teachers can print a roster of student usernames. Teachers log in using their normal cobbk12.org email address. Office 365 includes versions of these tools that can be used online in a web browser. However, students and their families can also install Office 2016 desktop applications on up to five Windows PCs or Macs at home! Not only that, but students can use their Office 365 accounts on the Office 365 mobile apps for smartphones and tablets. Best of all, the online applications, desktop software, and mobile apps all work together and synchronize through the cloud! Want to know more? Check out the Cobb County School District’s Office 365 implementation page.